Abby’s “happy monster” quilt is finished. I put the final hand-stitches in the binding at approximately 1:30 a.m. this morning. It feels good to get caught up in a project like this with my beautiful daughter. And she likes it! That’s the best part. I plan to embroider a label for this quilt. I’m going to stitch Abby’s “signature” and write a little dedication. This little quilt is our first major collaboration. I’ve enjoyed making it so much that I’m a kind of sad it’s over. There’s a bigger story behind this quilt than what I’ve shared here and I ended up it writing it up for my Mother’s Day art/craft column. 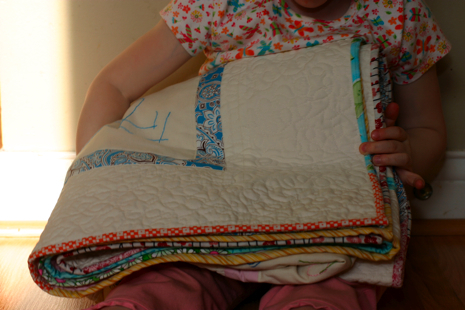 My editors got wind of this quilt project and asked me to write a column about it. When I sat down at my desk this morning, I was kind of surprised by the story that rolled out. I was only planning to write about this project, but I ended up getting way more personal than that. That’s the thing I love about writing, the truth and clarity that comes when I spend a little time at the keyboard. Sometimes I feel like I haven’t really processed the events of my life until I write about them. I invite you to come back here Sunday for the big reveal and links to my column. The mumbo jumbo above will make a lot more sense after you read it.